WHEN YOU THINK of family-friendly parks, you certainly don’t think of mounds of rubbish. But did you know that some really beautiful nature reserves and parks are based right on top of former dumps? In 2005, Ireland was found by the European Court of Justice to be in breach of the Waste Framework Directive at a number of sites throughout the country, including Kilbarry Landfill in Waterford City. A key component of the findings related to the loss of ecologically significant areas of semi-natural habitat, namely part of Kilbarry Bog in this instance, and according to Waterford City Council, Ireland’s response “included projects to construct compensatory wetland habitat”. In the council’s Development Plan, it was stated as an objective to “complete the remediation of the Kilbarry Bog landfill site including its development as a public amenity”. It has now rolled the development of the bog in with the redevelopment of the landfill and the proposed Waterford Nature Park. The park was officially opened on Friday 1 June by President Michael D Higgins. The Kilbarry Landfill was first opened in the 1970s, and as the President himself put it, the construction of a park on this site marks a new chapter in its history, “transforming what was as a negative on the landscape to something positive which aims to restore and protect our natural environment and heritage”. At that time little thought was given, little was said to the future consequences of simply burying rubbish in the ground. Things have changed in the intervening years. As a nation our eyes became opened to the impacts of our choices and we are educated to the values of reducing waste and maximising recycling. Remediation works have been carried out at Kilbarry landfill, with the lands developed as a public amenity area/public park. Kilbarry Park is around 50 acres in size and includes the creation of compensatory wetland habitats. How was it turned into a park? In October 2005 work began on the lining phase of this plan, with the installation of a plastic membrane to seal off the waste body from the surrounding environment. A “cap” of subsoil to a minimum depth of 1 metre was then spread out over the lining materials. In November 2006, work began on the installation of a gas extraction system, where the methane is burned off at the flare. The park focuses on attracting a diverse range of plant and wild life, creating a unique nature space in close proximity to the city whilst also providing a public area for recreational use. The park includes constructed wetlands, a wildflower meadow, and approximately 20,000 planted trees. The park also includes perimeter fitness trails, viewing areas with information boards and a seating/picnic area. Did the council get a grant? According to the Department of the Environment, the masterplan has been modeled on similar, but much larger landfill regeneration projects such as Freshkills Park in New York and Cultuurpark Westergasfabriek in Amsterdam. The department provided grant assistance under the Landfill Remediation Scheme, for closed licenced local authority landfills. The final use of a former landfill site is generally a matter for individual local authorities. 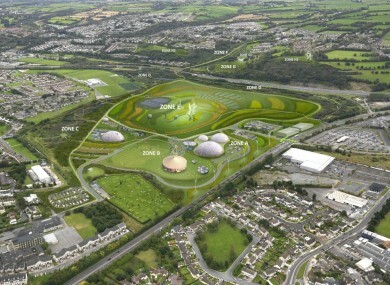 In Cork, work was recently announced on Tramore Valley Park, at the site of which was once city’s main dump. Michael O’Brien from Cork City Council explained that the site on the Old Kinsale Road was developed as a dump from 1964 – 2009. With 3 million tonnes/7 hectares of rubbish dumped on it, it was a major landfill. The council got a licence from the EPA to manage it, and as part of this they had to cap the site and cover it with specialised clay material. They also had to collect the gases and leachate which naturally are produced by the dumped materials in the landfill. The site has been progressively capped for the last eight years at a cost of around €30 million. There are still 7.5 hectares / 23 acres left to cap, which will hopefully take place next year. As part of the capping process we are designing it in such a way that it can be converted immediately into an ordinary park. It has also been designed for events in certain areas. A masterplan for the site says that it could eventually be used in the long term for outdoor events, and it is planned that it will be used as a motorhome park and an adventure park. The current funding is for finishing the capping process, and another €10 million in funds is needed to put the other plans in place. That money will come from a variety of sources including the Government and tourist agencies. The site is 2kms from city centre. It is hoped that it will connect with the Vernon Mount area in coming years and allow cyclists to travel straight from the Grange and Shamrock Lawn areas, for example, into the city. The site already generates electricity for between 1500 – 2000 people by taking gas being generated underground. The site will also have a biodiversity element with lots of flora and fauna. The plan is to set up the site so that big events can be held there, with adventure sports and activities, an assault course, climbing wall, viewing tower, zip wires and a 3D maze. Then there are hopes to have nature trails and outdoor classrooms made from recycled materials. What about the dumped waste? The Cork site was prepared for being turned into a park with soil, subsoil and topsoil being placed over the clay. The rubbish has been compacted by the council, but as it breaks down it will shift somewhat. O’Brien said that because of this, there will be no buildings in the areas that are most vulnerable to changing. According to the City Parks Blog, in the USA in 1915, the former Rainier Dump in Seattle was turned into the Rainier Playfield, while the Miller Street Dump was later turned into part of the Washington Park Arboretum. One landfill-turned-park in Virginia Beach is called Mount Trashmore, in homage to its past, and was made in 1974. Acres of green land cover over an 800-foot-high mound of refuse. However, in Ohio, some parks ran into trouble with fluctuating levels of methane gas. Officials said the issue was being overblown, but locals said the dumps weren’t monitored. Below are some photographs of what the Cork dump site could look like when all the work to transform it into a park is completed. What do you think of landfills being turned into parks? Email “Explainer: How do you turn a landfill into a park?”. Feedback on “Explainer: How do you turn a landfill into a park?”.